When it comes to the way we envision ourselves on our wedding day, we all want to be able to look in the mirror before walking down the aisle and see the same thing staring back at us...beautiful, clear, dewy, positively glowing skin! Is that really too much to ask? Nope. It most definitely is not. And it most definitely can be our reality too. But beyond all the foundation and fake lashes, lies the real secret to achieving that bridal glow. Of course using quality, clean skincare products, finding an amazing facialist, and exfoliating regularly are all essential when it comes to maintaining the health of our bodies largest organ (our skin! ), a truly glowing complexion starts from within. That's why it is so important that we focus not only on what we put on our bodies, but what we put in them too. We all know the obvious things you should do leading up to saying I do. Like drinking insane amounts of water, exercising regularly, consuming less caffeine and alcohol, and making sure to get plenty of beauty rest. However, there are a few more things to incorporate into your daily routine that will really help you attain the vibrant skin you are after...like this Green + Glowing Smoothie! I am a big advocate of starting your day with a green smoothie. I truly believe that it is one of the best and simplest ways to get a ton of essential nutrients with a meal that requires little time and even less work. Below is more information on why the ingredients listed in this recipe will help you get your bridal babe glow on! I could write an entire blog post on the benefit of dark leafy greens (I'll save that for another time), so here are just a few of my favorite fun facts. When we consume greens on a daily basis, we naturally begin to crowd-out excess junk. Our bodies transform into more alkaline environments for us to flourish, our immune system is supported, our blood becomes purified, and our respiratory systems cleared. Greens are filled with vitamins and minerals galore (vitamins A, C, E and K, calcium, magnesium, iron, fiber, folate, chlorophyll), and if there is one thing that can really get our skin glowing from the inside-out, it would be have to be dark leafy greens. The best part, though, is that when thrown into a blender along with all of the other yummy ingredients listed below, you can't even taste the greenness (if that kind of thing freaks you out). Promise! Blueberries are a fantastic low-sugar fruit that are loaded with antioxidants and make for one of my favorite smoothie additions. Chia seeds are a fantastic source of omega-3 fatty acids which is an anti-inflammatory that is key for beautiful skin. They are also a complete plant-based source of protein (meaning they contain all of the essential amino acids), are high in calcium, manganese, and soluble fiber (which acts as a broom for your digestive system, keeping you regular and keeping your gut happy and healthy. And since over 80% of our immune system lives in our gut, a healthy gut = healthy skin, among other things). Coconut oil is used as much in the kitchen pantry as it is in the bathroom cabinet. It is a healthy fat (don't be afraid of this..healthy fats are a must! ), an antibacterial, and an antifungal that works wonders on clearing up skin from the inside and out. Coconut oil also makes for one crazy deep conditioning hair mask! Maca powder is my favorite when it comes to female hormone imbalance. My smoothies are never without a teaspoon of this empowering superfood. What it is: A natural blue-green algae that is grown and harvested underwater that is a complete protein. It is rich in a lot of necessary nutrients like iron, calcium, magnesium, selenium, and B vitamins, and has a lot of chlorophyl as well, which is good for cleansing your blood! Cinnamon is an antioxidant and great blood-sugar stabilizer. I always add a dash to finish off my smoothies. Place all of the ingredients in a blender and blend until smooth and creamy. Top with bee pollen and enjoy on the daily! 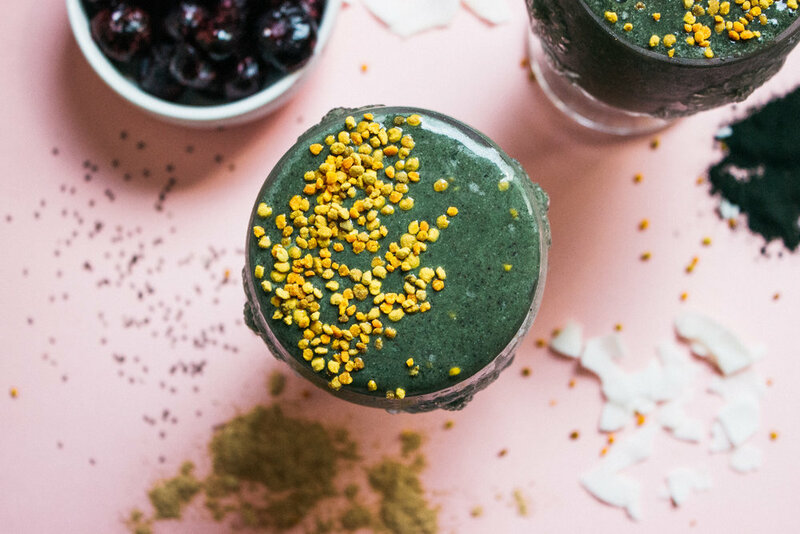 This Green + Glowing Smoothie is the recipe to achieving that inner-outer beauty glow for your special day and all the festivities surrounding it. Now glow and enjoy!